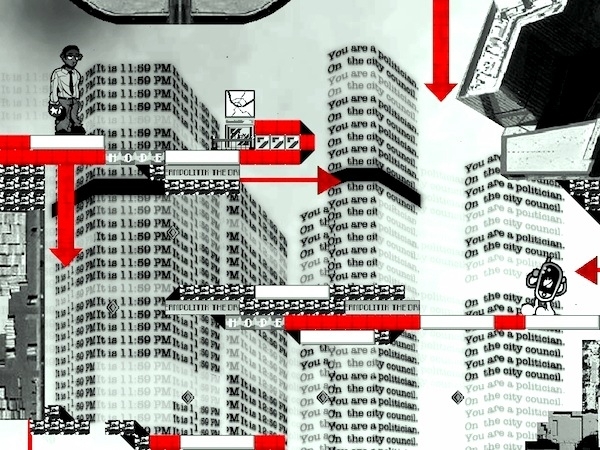 In this politically cerebral platformer, you direct a town hall politician within the architecture of his own dream a minute from midnight. For in order to combat the nation’s desire of an unpalpable vision of dreamlike utopia, the politician must initiate a dream of his own to visualize the solution. Your adventure through society in its shimmering spectacle begins at 11:59:00 and ends at 11:59:59. Inspired by the literature of Guy Debord and Stephen Duncombe within the context of the contemporary age. Benjamin Poynter is a practitioner of digital media in the contemporary world gravitiating toward concepts involving augmented existence and experimental theatricality. He is currently studying towards a Masters of Fine Arts degree at the far west University of Nevada Reno (USA) emerging originally from the more centralized Oklahoma City, Oklahoma. Benjamin envisions new media as a constellation of interaction that has perused erratic, gray nexuses between the continents of fantasy and reality. With this intersection evident, the holy barrier between intellect and the emotion rises. Two elements have remained a constant in his life : isolation in this aforementioned society of spectacle and hard work for the things he loves (more evidently including art). Being submersed in digital entertainment since he began reading the films of Pay- Per-View screens at age two, the shiny projection within a breakable, black box always dictates his day. In a world seemingly gone mad through trying to bring rationality unto itself, Ben believes an irrationality to the rational is what shifts power from cold autocracy back to imagination.